This image – rather than our usual Imaggeo photo – is a simulation representation of Hurricane Irene, as it moved up the coast of the United States. The red-yellow areas in the image represent regions with high aerosol concentration that have been swept upwards in convective clouds and the blue areas are clean regions. The aerosols enter Irene along rain bands, before being wrapped into the centre and rained out as they circulate around the eye of the storm (the eyewall). “Aerosols over Hurricane Irene” by Nir Benmoshe, distributed by the EGU under a Creative Commons licence. Aerosols, weather natural or anthropogenic, affect cloud microphysics. 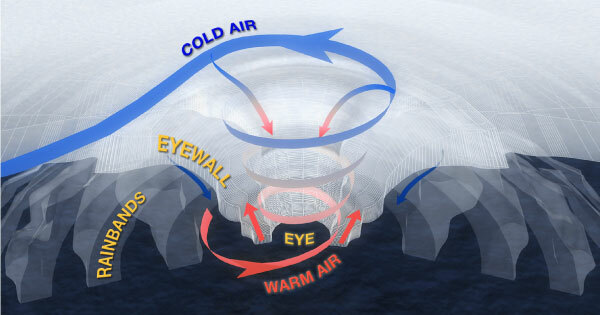 Small aerosols are capable of stimulating tropical convection, and increasing both the cloud top heights and vertical velocities in convective clouds. The stimulation convection at the outer-most regions of a hurricane causes it to weaken. This is because it lowers the pressure gradient between the hurricane and surrounding air. In addition, convection at the storm periphery produces a compensatory downdraft of air that dampens convection in the eye. Hurricanes are driven by strong updrafts of warm, moist air at their centre and dampening of this process causes the storm to weaken further. 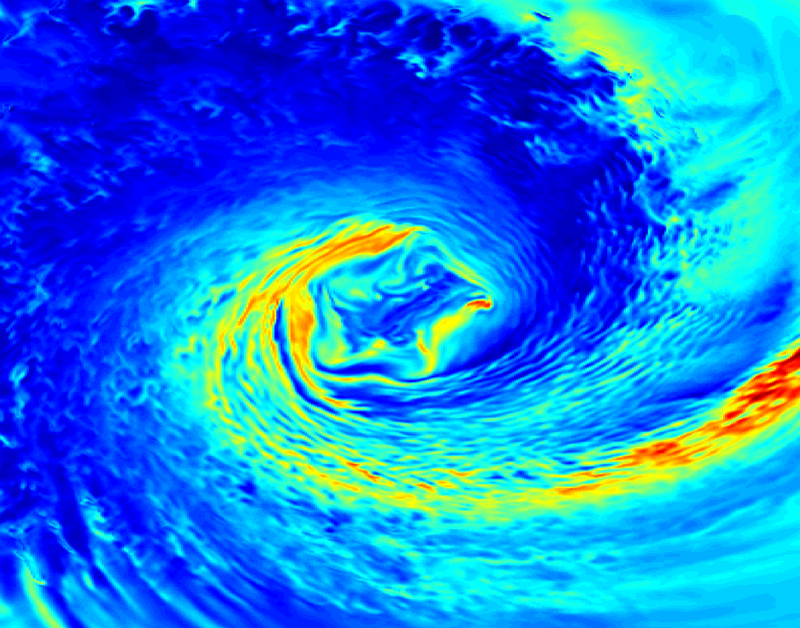 The structure of a hurricane (Credit: The COMET Program Steven Deyo/USGS Betsy Boynto). Hurricane Irene was forecast to be a Category 3 Hurricane it approached the coast of North Carolina, but was reclassified as a Category 1 as its force waned. Hurricanes dissipate as they move over land and lose the source of warm water that drives convection in the centre of the storm. The affect and presence of aerosols would also have contributed to the weakening Hurricane Irene. The Saffir-Simpson hurricane scale. In addition, tropical storms are in the region of 63-118 km/h and tropical depressions have wind speeds below 62 km/h. See here for descriptions of the damage expected in each case. Khain, A., B. Lynn, J. Dudhia, 2010: Aerosol Effects on Intensity of Landfalling Hurricanes as Seen from Simulations with the WRF Model with Spectral Bin Microphysics. J. Atmos. Sci., 67, 365–384.